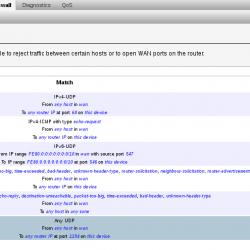 This outlines a typical VPN implementation with server, clients and routing. Using Attitude Adjustment 12.09. Although, this should work on any new version of OpenWRT. Last tested on version 17. Start by ssh’ing into the router and installing packages. edit the following or don’t if you want to enter it manually on certificate creation. run ps while you are running build-dh to see what command is being used. Instead of using UCI syntax we can break this out to be more openvpn standard and troubleshooting friendly. Also, I have added the ability to set static ip’s for the openvpn clients. If you want to enable the static client ip assignments, be sure to uncomment the client-config-dir above and make a directory as such. write a file inside the clients directory with the same name as the “common name” of the openvpn client certificate. This will reserve 10.11.13.123 for user jason. Sometimes its helpful to run it by hand, for troubleshooting. in /etc/config/network or in LuCI. 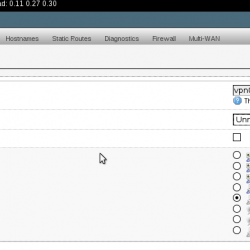 Create a zone called openvpn_zone with vpn0 network. We now explicitly declare the forwards like this. Allow the openvpn server to accept connections from clients out in the world. # Allow all traffic in and out of the tun interface. or you can run build-key-pass to issue a key that asks the user to enter the password before it is used (more secure). Once you have completed the build-key, being sure to answer yes to signing the certificate and commit. Now you need to get the keys for jason and the ca.crt (not ca.key!). Each client needs these files to connect. Test the server by connecting from off-site. cd into your local config directory where your certs, keys and .ovpn config are. Let me know in the comments or use the contact form if you find errors or need clarification. This is a concise tutorial and might need some clarification.